Each teacher who received consultation services took the Inventory of Teacher Stress assessment (TSI), a 43-item self-report measure of teacher stress. Teachers completing the measure are asked to complete the items after “reflecting on a specific student with whom they experience some difficulty,” and considering how they feel about their interactions with the student. Teachers were given the TSI in Fall and Spring. At the Spring administration of the TSI the measure was also administered to a control group of 7 teachers at the Franklin Children’s Center. The control group teachers did not receive either any consultation services from CALM, allowing us to draw some conclusions on how ECMHC and Reflective Practice may impact teacher stress and consequently the teacher’s ability to respond assertively and empathically to the children under their care. Differences in mean scores are presented in Table 3, the percentage of each group with elevated/clinical scores are presented in Table 4. Graphs of these results follow each table, Figures 3 and 4, respectively. This graph looks only at teachers who had scores which places them in the elevated or clinical range. Across domains, teachers that received ECMHC & Reflective Practice demonstrated considerably lower levels of stress compared to teachers that did not receive ECMHC and Reflective Practice. Even with the relatively small samples, the differences were large enough between the groups in Sense of Competence / Need for Support, Frustration working with Parents, and Teacher Characteristics (overall stress) that they reached clinical significance (p<.05) in an independent samples t-test. The percentage of teachers demonstrating elevated or clinical scores was also much lower among teachers that received ECMHC & Reflective Practice, as demonstrated in Figure 4. Nearly half of the teachers in the control group demonstrated elevated/clinical levels of stress overall, while none of the teacher receiving ECMHC & Reflective Practice did. Two subscales in particular are worth noting; 57% of control group teachers reported elevated levels of stress related to feeling incompetent/needing support, while only 6% of teachers receiving ECMHC & Reflective Practice reported high levels of stress in this area. Additionally, 71% of control group teachers reported experiencing high levels of frustration in working with the parents of demanding students, while only 6% of teachers receiving ECMHC & Reflective Practice experienced high levels of stress in that domain. 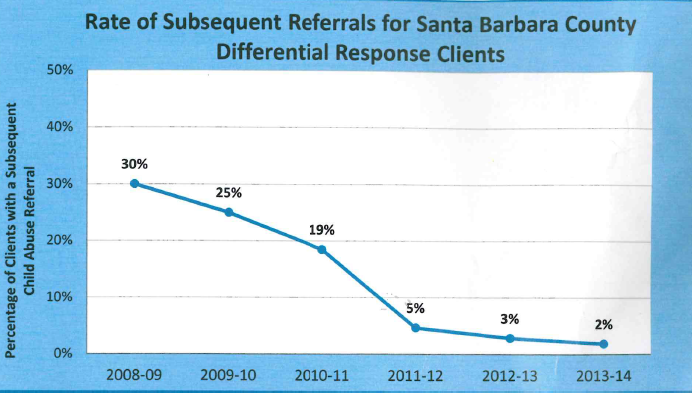 Differential Response, known as Front Porch in Santa Barbara County, is an approach to ensuring child safety that is expanding the ways in which Child Welfare Services is responding to reports of child abuse and neglect. Front Porch offers a broader set of responses for working with families at the first signs of trouble, to help support families that are in need, and before further problems develop. With Differential Response, Social Workers and partner agencies in the community work with families to engage them in finding solutions and to provide focused services so that families will be empowered and supported to make needed improvements. Great Beginnings is CALM’s prevention and early intervention program for children pre-natal to five years old. Because we know that caregivers impact brain development, we use standardized assessments to measure parents’ beliefs about child rearing and their stress level in order to evaluate whether or not our interventions are making a difference. We also measure children’s behavior, which tells us whether or not our educating the parents impacts the children. What follows is a series of four charts which shows the change in attitudes, stress, behavior and depression at the beginning of treatment and again after six months of treatment. CALM is proud to present outcomes and to continually evaluate the effectiveness of our work. From fall 2012 to spring 2013, a total of 6 fathers participated in the SFI parenting classes. All participants identified as Hispanic. Out of the 6 participants, 5 fathers completed the Adult Adolescent Parenting Inventory (AAPI-2) before the program began and all 6 parents completed the AAPI-2 after the program completed. The AAPI-2 assesses parenting attitudes in the following domains: appropriate expectations, appropriate empathy, corporal punishment, appropriate roles, and oppressing child’s power/independence. Scoring in a “clinical range” on this measure indicates a score in the bottom 5% of nationally distributed scores, and is indicative of attitudes that may lead to child abuse. The SFI program dramatically improved fathers’ parenting attitudes: before starting the program, 67% of the fathers fell into the clinical range on the inappropriate parental expectations domain, and 50% of the father fell into the clinical range on the lack of empathy/awareness of child’s needs domains. After completing the program, 0% of the fathers were in the clinical range for either domain. 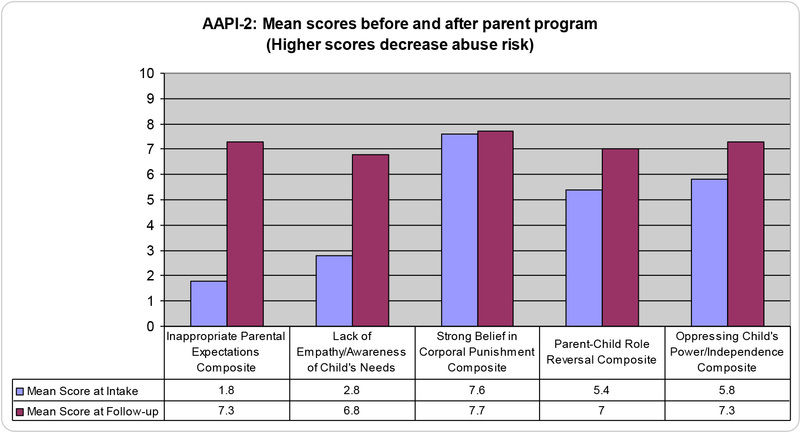 Similarly, the graph below shows the average scores on each AAPI-2 composite before and after the parenting classes. Higher scores indicate a decreased risk for child abuse. As the graph shows, scores on all composites improved after the parenting classes (except for strong belief in corporal punishment, which began at a high, non-clinical level).